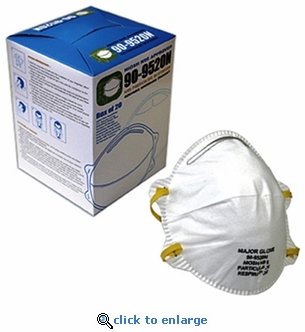 This Box of 20 N95 disposable respirator masks are ideal for light or short duration exposure to dust and particulates in the workplace, search & rescue or disaster clean up operations. These economical cone molded respirators will protect users from harmful particulates, such as those encountered during sanding or sawing wood, installing fiberglass insulation or general dusty conditions. Box of 20 N95 Disposable Respirator Masks. 95% filtration efficiency against dusts, microorganisms, fumes and non-oil liquid aerosols. Recommended by the CDC for people who come in contact with the AVIAN Flu (bird flu) Virus. Low-profile design with smooth inner lining provides a secure seal.